Listen. Can you hear it? The thunder of your soul, roaring within the thousand thousand worlds that exist within you. Gods are there, inside you. Worlds of dream and knowledge, chains of purest gold that bind you to each and every other mind that walks this earth. Sink beneath this base flesh and find the noble self within. Read the words written on your soul. Speak the names you find there. Set yourself free. 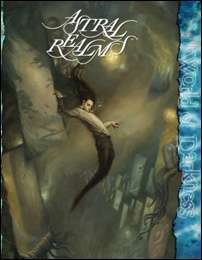 Astral Realms is a supplement for Mage: The Awakening. This title was added to our catalog on March 07, 2008.